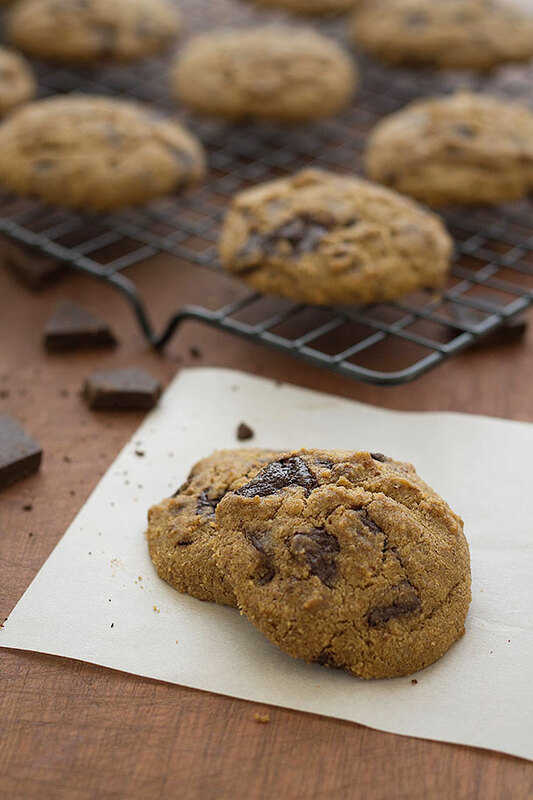 Something that has always beckoned me to the kitchen while my mom was cooking as a kid was the sweet and buttery aroma combined with rich espresso scented melted chocolate known as chocolate chip cookies. As most people I only remember bits and pieces of my childhood but one significant thing that I remember is just that. The rolling thump of my heartbeat increasing with excitement as she pulled out the steaming fresh masses of soft and chewy dough with oozing chunks dark chocolate. It’s actually quite an exotic feeling that I get whenever I inhale the scent of fresh baked chocolate chip cookies. It’s the only type of fresh baked good that really causes it for me, but it’s sort of a jump in your heart after filling your lungs with it’s alluring aroma that brightens everything up. A lot of the time I actually helped my mom bake chocolate chip cookies as we licked the batter and played around in the kitchen. I try not to boast to much about it but my mom also had the best chocolate chip cookies. She has her stuff down more than anyone I know. I’m not certain what brought on all of these thoughts for my mom’s chocolate chip cookies but it was torment everytime I thought about it. I wanted to match the taste of hers as much as I could but almond flour wasn’t really doing it for me taste wise. Then I realized, why limit it to just almond flour? That’s where grinding up fresh pecans very finely came into play. My first thoughts were fairly skeptical until I couldn’t resist licking the spoon while mixing the batter. I dont think I’ve ever actaully gotten this happy over a recipe before but it sure made me happy once that glob of sweet gooey batter entered my mouth. My eyes widened and I exclaimed several words which will not be repeated on here. I couldn’t help myself, it was just so good. I then proceeded to lick the spoon again, then dunk it in the batter and lick it again. Come on now, don’t act like I’m the only one guilty of that. Not to mention it would be an injustice not to eat a little of this dough prior to spooning it out on the baking sheet. Just be careful, because it’s incredibly difficult to stop once you get going. Kind of like an unattended wagon rolling down a steep hill, it just keeps going and going until it smashes against something, which in this case it would be your spoon smashing against the empty bottom of the mixing bowl. But as I was saying, the use of the pecans in this surprisingly made this taste almost exactly like cookie dough. You don’t really even taste the pecans what so ever, it’s more of a subtle change that brings it together to have that sort of cookie dough flavor that makes these so good. Even my mom approves of the taste and texture of these, and that is a big deal. So if you won’t take my word for it you should seriously consider taking hers. 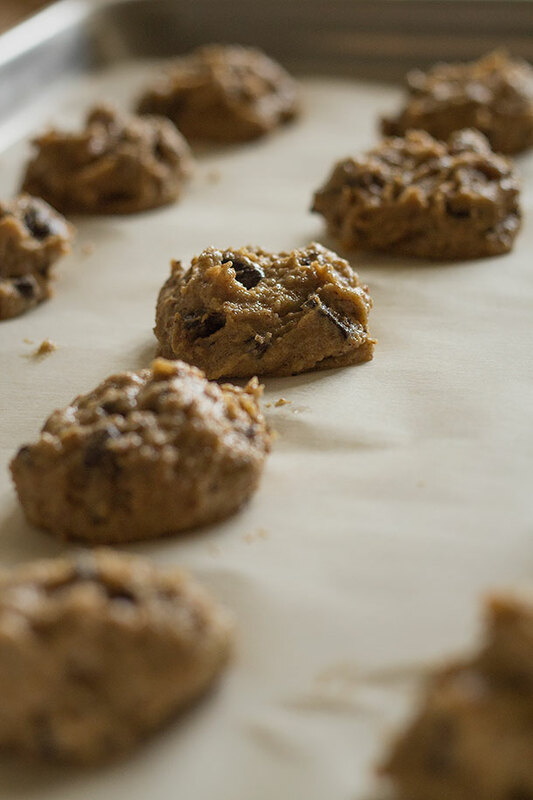 Preheat the oven to 350 degrees and line a medium baking sheet with parchment paper. In a medium bowl add almond flour and baking soda and incorporate with a dry fork. 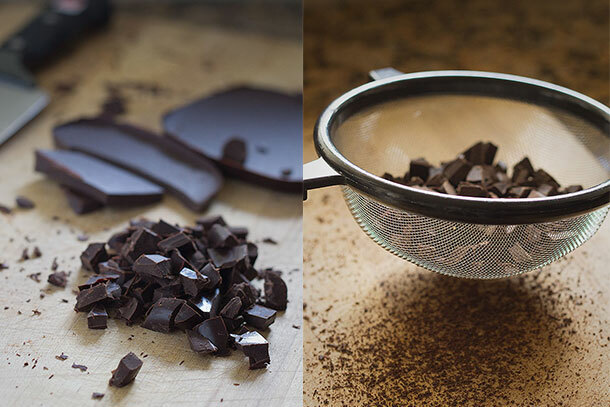 In your bowl of mixed almond flour and baking soda add the finely ground pecans and chopped chocolate. In a small bowl add egg, vanilla extract, liquid stevia and your choice of softened butter or ghee or melted coconut oil. Pour wet ingredients into dry and mix until thoroughly incorporated and well combined. Place in preheated oven for 10-15 minutes or until they are slightly firm to the touch or begin to brown around the edges. Absolute best cookies ever! I had to add 1/4 cup more ground nut flour for the honey and coconut oil.Perfection. No one even noticed they were gluten free dairy free. I am going to try replacing the egg with a banana next time to make vegan! Thanks so much. I wouldn’t recommend replacing the egg with a banana. It’s going to sweeten it even more as well as not give it the rise that’s necessary. Why why why did you post this when I’m doing the Whole30?! 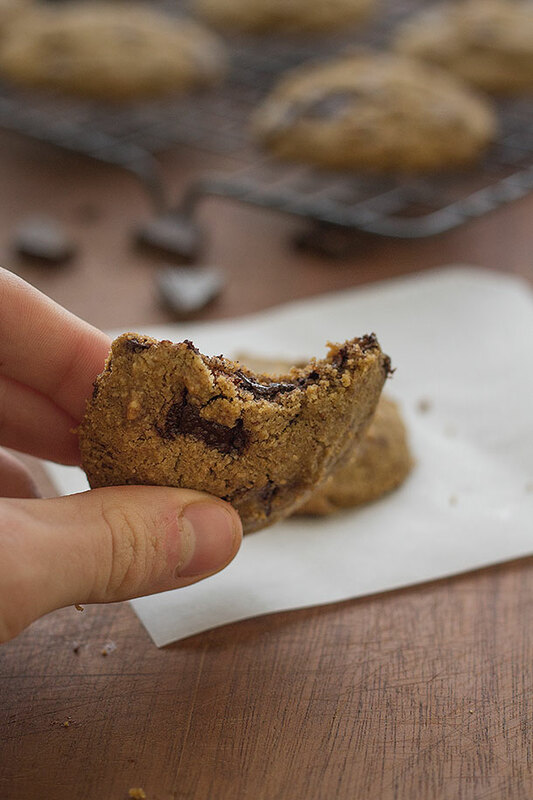 I’m not usually tempted by paleo treats, but these… THESE I want to make. I suspect the pecan flour is GENIUS! Well-done, friend! Thanks Melissa, do let me know if you try them. And be sure to take pictures! I tried these, and they were amazing!!! Thank you so much! I had been looking for a perfect recipe that doesn’t include coconut oil or adding salt. These were it! Do you have a good substitute for the egg? I’m allergic. But I am craving a good homemade cookie recipe. I finally have a good bread recipe that works with my bread maker. I am missing this! as soon as i saw these, i pulled out what i needed and got down to business. didn’t even finish reading the rest of the posts in my RSS feed, because i knew that the addition of those pecans was going to make a big difference. 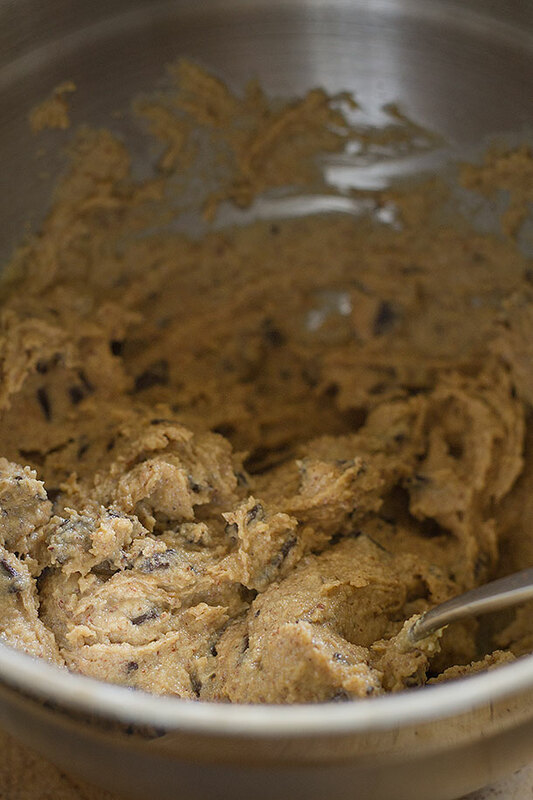 the dough is fantastic–didn’t even add any honey because my chocolate wasn’t 70% and it STILL tastes amazing–and i can’t wait to taste the cookies! Ah, the cookie dough is always irresistible. Glad you liked the dough. Hope your cookies turn out and your welcome to send in any pictures on my Facebook page or twitter of the final product, I’d love to see how they turn out. I’ll probably be trying these tomorrow ….always like to try your recipes ! Have you ever tried Plugrá brand butter…I used to like kerrygold, but when I found Plugrá, I was in love. It’s European butter and has 82% butter fat. I’ll post.pictures when I make them, it’s kind if hard because it looks like the Tasmanian devil ran through my kitchen after I finish cooking ( always) because my 3 year old always likes to help. Thanks again josh for sharing !! No I have never heard of that butter thanks for the suggestion I’ll check it out. ALthough I don’t know if I could ever stray from my favorite brand. I really like Kerrygolds butter. Sometimes I use the butter that my local farms make but Kerrygold is what I usually use if I’m using butter. I am so glad you tried the pecans! I’ve been thinking walnuts would taste good ground as flour for a cookie. But pecans sound even better. Can’t wait to try this! The pecans really make this recipe to be honest. I’m really surprised how much the cookie dough actually tastes like the real thing. Granted I haven’t had the real thing in a while but even my mom approved, so that’s a pretty big deal. Well, I finally made them tonight and I was singing your praises!! They turned out sooo good! Closest thing I’ve had to the real thing in a long time! In fact, of all the low-carb desserts I’ve tried, this was the best! Oh, and I second the recommendation for Plugra butter. 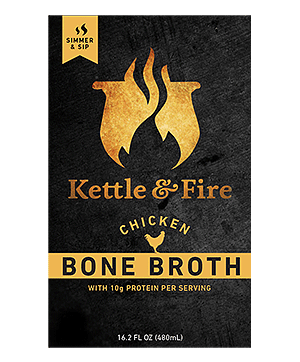 I’m not sure if it comes from grass-fed cows like Kerrygold, it may, but the taste really stands out. So glad you liked them Sally, i’m really happy with this recipe as well. And I’ll have to check out that Plugra butter. These looks so awesome! My daughter and I are starting a 30 day challenge, and the no sweet treat thing looks awfully daunting to her, especially with being around all of our baked goodies at our shop. So these are perfect! Hey any news of coming to Colorado to check out colleges? We would love to see you! Glad to be of assistance, let me know how you like them. I will probably be coming up to Colorado sometime this summer as a matter of fact. If I do I will definitely stop by and love to meet you and your family! They turned out really good! I went a little overboard with the Stevia in the chocolate chips, but other than that, those are some yummy cookies. I was thinking I may even start offering them at the shop…how would you feel about that (of course I would give you credit for the recipe)? Love to see you this summer! These sound great! I have tried using walnut flour but never pecans! Maybe when I am off this sugar cleanse I will give them a try! Already failed the cleanse today and made molasses cookies! No will power! These sounds fantastic. I’ve been making a paleo/vegan chocolate chip cookie with almond flour and coconut flour I found at Cookie & Kate, but I’ll have to give this one a go. Those pecans are far too tempting. These cookies look delicious! I will try them soon for sure. ps-LOVE your photography and LOVE the picture that comes up when you hit “print”! Thanks for sharing! I just made your Grain-Free Chocolate Chip cookies and I’m blown away by how good they are. Even my ultra picky 16 and 15-year old daughters loved them. I didn’t have Stevia so used honey and added extra almond flour, per your suggestion. This is the first paleo dessert I’ve made that the entire family loved. Also – your story of not just losing weight but getting healthy is truly inspirational. It’s so wonderful that you’ve turned something that was once your downfall (food!) into a healthy passion that helps those of us also struggling. Thank you, Joshua! Thanks for the story Jennifer, I’m glad you enjoyed them! Wow! I have tried dozens of GF SF recipes and nothing compares to this! The pecans make this and I am in love. Never have I tasted a batter that matched a “traditional” cookie before this one. I could have eaten the whole bowl! Thank you for yet another great recipe. This is our new favorite! LOVE your recipes! My husband and I went on Atkins 7 weeks ago with huge success- I’m done losing and now eating a more Paleo/Primal diet, but I love to see your Stevia substitutions since we are both avoiding honey due to sugar content. Question: how much dry, no-additive Stevia is equivalent to the liquid Stevia amounts that you’re using? Would I need to add more almond milk if I used the dry form? It depends is it pure Stevia Extract? If it is then the same amount should be equivalent. These cookies are amazing! I didn’t have almond flour, so I used 1/2 c coconut flour and 1/2 c flax seed meal as a substitute. I also added cinnamon and a pinch of salt. I’m not a strict paleo at all, really my goal is to cut out refined sugars and most wheat flours. So this was a perfect recipe for our family! My cookies turned out completely flat. Maybe I didn’t grind the almonds fine enough – I am not sure. Any thoughts? I had to make my own almond flour because I didn’t have any. They are a tad greasy and did not stay together well at all. They did taste amazing but I am sad about how they look. 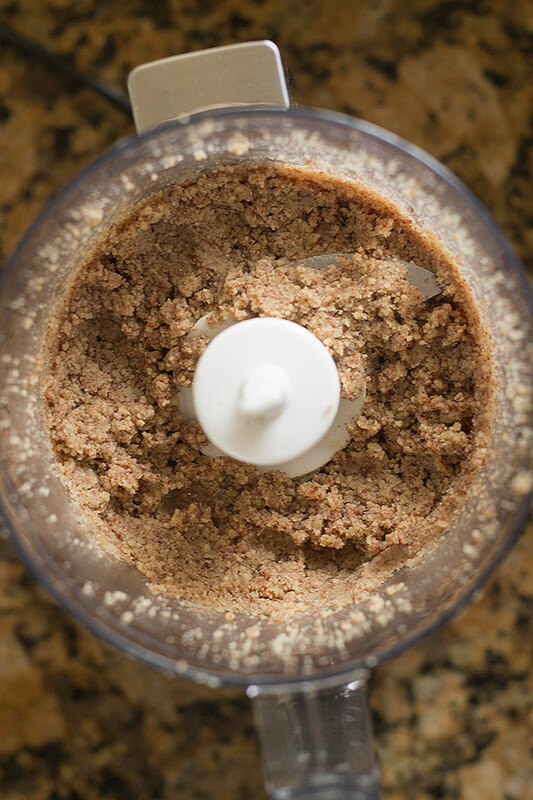 The use of fine ground almond flour like the one from Honeyville really makes a huge difference and I have a good feeling that is why they didn’t turn out. Made these last weekend and blogged about the awesome result. Hopefully you’ll get some new fans and click throughs from the article. Also mentioned it on my FB page. They were fantastic! Thanks so much for the recipe. I’m going to cook my way through most of your recipes. Love love love your site! Between you, Tim Ferriss, Tim Noakes, and a few others, you’re inspiring me to a better way of living. I’ve lost 5 kgs almost effortlessly as a result. Thank you Joshua! Joshua, I hope you read my message. My message is not specifically about this recipe but it is for you, the individual. 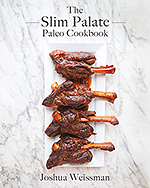 I discovered your blog through a Kindle book called “Intro to Paleo: The Natural Diet to Burn Fat, Lose Weight, and Build Muscle”. I am much older than you but like you I have always enjoyed food from day 1. I am currently overweight and have tried half dozen or so “diet” plans and always abandoned them because they have proven unreasonable. I just couldn’t accept the meals they suggested. Your story has been very inspirational and has given me hope that I can enjoy food with your paleo recipes and become healthier. Thank you very much! You seem like a genuine person and I hope you go very far in life. I wish the best of luck to you Vishal. I can tell you will be able to achieve your goals, so keep at it. Thank you so much for the kind words. I came across your website yesterday when I was searching for an arugula pesto to go with pan-fried salmon and sprouted quinoa for dinner. It complemented the dish so well. Thanks for sharing your inspirational story and wonderful recipes. I can’t wait to try others! Just made my third batch of these. They are keeping me SANE on my low carb diet and “breaking my sweet tooth” addiction. Thank you thank you thank you! I am now making these every weekend to last for the upcoming week. Will be trying your zucchini fritters tonight, as I need to get more veg and less dairy into this eating plan – migrating from a junk food diet to a low carb/paleo lifestyle is a process that takes time. For those of you out there thinking about it, it isn’t an overnight thing. You have to start with one small doable change at a time. I’ve been doing this for about 4 months now, slowly making one change at a time. Am totally off carbs and sugar, but still overly dependent on dairy. Getting there one step at a time. Not stressing if I fail now and then, because each failure has been a “failure to plan ahead” as opposed to a “am so hungry, I’ll eat anything I can get my hands on”. I’ve lost 7 kgs and it has been so easy. I made these today. I used raw pecans and a bit less than the required honey. I thought they were ok. My husband thought they were gross. Next time I’d use regular roasted nuts, stick to the whole 1/4 cup of honey. These cookies are great! My hubby and I have been on a candida diet for a few months now and decided to treat ourselves. We tried another choc. chip cookie recipe but it just didn’t have that buttery taste. When we saw the pecans in this recipe, we knew they would be good. We almost used stevia, but decided on honey and added some almond butter too. Glad we did. They are so tasty! I just made a batch of these delicious cookies and will absolutely make them again. I think grinding up the pecans is a stroke of genius, it adds a wonderful depth of flavor. I could only find Kerrygold unsalted, so I added about a third of a teaspoon of sea salt. Have you ever tried Scharffen Berger 70% baking chunks? Fantastic chocolate, with a great smooth finish. My hubby can’t stand most nuts, though he will eat almonds. Can I an extra cup of almond flour in the recipe instead of the chopped pecans? Sounds like a fabulous recipe! any nutritional info., diabetic exchanges available? Sorry I don’t do calculations for nutritional information but I do know these are fairly low in carbohydrates and sugar. I would assume it would be a great treat for diabetics as well. You could use stevia to make it even lower in carbs and sugar in which case it would be perfect. Hi! Can you substitute cacao hibs or raw cacao for the 70 chocolate? I’m pre-diabetic and really have to watch my sugar intake. Thanks! Also, vanilla extract has sugar in it so I’ve been substituting with vanilla powder. Do you think that would work as well as the extract? I thought dark chocolate was okay for diabetics but if not you can use chopped unsweetened baking chocolate. Also most vanilla extracts do NOT have sugar in them, so I am pretty sure that it’s just the vanilla extract you have that has sugar added to it. I would suggest looking around at the store at different vanilla extracts and picking up one that doesn’t have sugar in it. Loved the flavor of these cookies but the finished texture was not good. 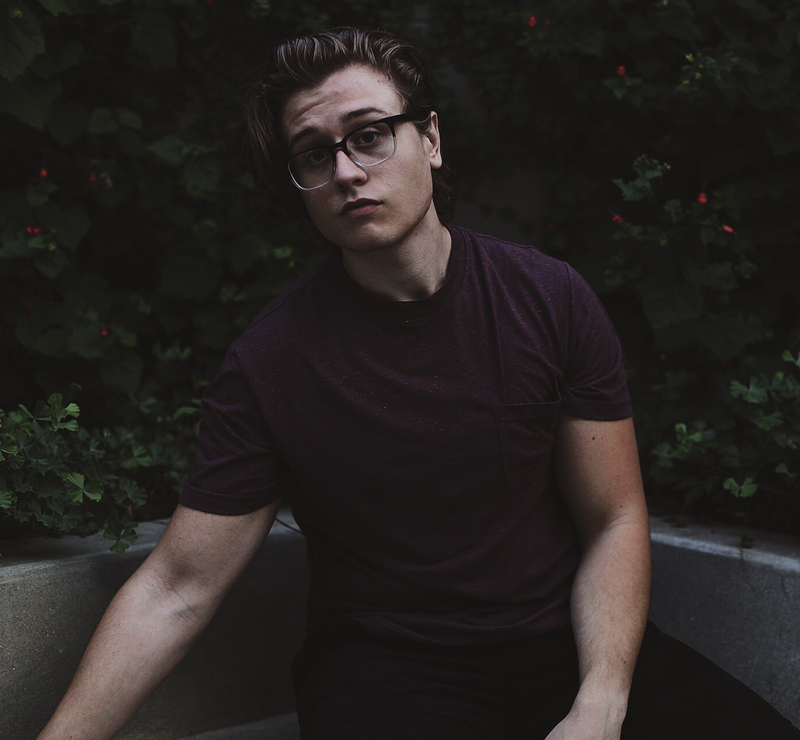 They were crumbling and spread quite a bit, so thin and fragile. I used softened butter and followed recipe to a “t”. Next time I will try putting them in the fridge before baking. Hello,we don’t have pecans here in Italy,do you think I could use regular walnuts? I’m fairly sure that walnuts will work just fine. Just made these and they are amazing! The variation I used was the kerrygold and honey and I added about a teaspoon of cinnamon. I am so glad I found this recipe! Just made these using a cup of raw Oregon hazelnuts, which with their natural sweetness allowed me to back off the honey a bit. SPECTACULAR! I am new to your sight. I’m trying to avoid sugar, but am having trouble understanding if the 70% dark chocolate you mention is sweetened or unsweetened? If sweetened, what with? Thanks! 70% chocolate is sweetened, but it’s less sweet than “dark chocolate” which is usually about 60%. The percentage refers to the cocoa content. Would this still be good without pecans/nuts or possibly a substitute for them?? Sure! I actually recommend my newer chocolate “chunk” cookies. They can be done with chocolate chips and they are way better than these. Oh my!!! Been craving for chocolate chip cookies all days , so bad, I even taught about it while meditating!!! Been cutting on sugar, so I decided to try your recipe!! Oh my my I tried one fresh out of the oven!!! BIG MISTAKE!! :) They are so good!!! There’s a new recipe in my cooking book!!! Thanks!!! I want to eliminate the pecans from the recipe, I know you had said that could be done, and you also suggested chocolate “chunk” cookies as an alternative since it requires no pecans, but that recipe uses coconut sugar which you said should not be substituted with any other sweetener, but that won’t work for me, so I’ll need to stay with this recipe. If I do that, eliminate the pecans, does the recipe still work, or do I need to add something in its place? also, is there a way to make these cookies crispy rather than chewy? You could sub any other ground nut if you like. Or just sub the rest with almond flour. The pecans are there just for flavor. Hello,do you think I could use another oil?like olive oil? I am going to try some desserts that are not made with flour or sugar. Thank you for sharing them with us on the internet. Made your choc chip cookie. Pretty good substitute for the real thing. I’ve finally rid myself of a sweet tooth so really haven’t made anything that resembles s dessert nor miss it. So I will freeze these and eat occasionally as a treat. 5 Stars!. Would love to post my picture but didn’t know how. Help! All these reviews are so fantastic and mine came out with a rough texture and crumbled when bitten in to. My chocolate melted with stevia was not sweet either. Did I not ground up pecans fine enough or is it bc I used almond meal/flour? I was so hopeful and followed everything to the letter. Any advice would be greatly appreciated! Hey Julia, I recommend using this better updated version of cookies here. Your recipes are amazing and you’re an inspiration! I needed to go paleo and sugar free for health reasons and I love your blog. I tried making these cookies but I think I may have done something wrong, because they were pretty crumbly. How would you recommend getting them crispy on the outside and chewy on the inside? Thanks so much and keep up the great work! Can you make a cookie recipe without added sweetener or sugar and using cacao mass for chocolate? I don’t know what type of liquid Stevia was used, but I had liquid Truvia. One quarter of a teaspoon made them taste horrible! I added about 1/4 cup more of the Truvia and 1/2 cup of Truvia brown sugar. Much better! I doubt I’ll make them again but these are for a neighbor.